Camping during the chillier season can be beneficial. You don’t have to worry about crowds, which means you can snag the best camping spots. Camping during off season also means you don’t have to worry about pesky insects. But, camping in colder temperatures also brings challenges. One of the biggest problems? Staying warm! It’s easy to stay warm when you are hiking and moving around. But, at the end of the day, proper sleep is a must. Proper sleep means resting comfortably throughout the night. There is nothing worse than waking up cold. What’s even worse is waking up cold outside of your own bed! Sleep is needed so that you can recharge and prepare for upcoming adventures. But going to sleep cold all but ensures a horrible night’s sleep. Planning a camping trip in the fall or winter? If so, you’ll need to know how to stay warm camping in cold temperatures. Knowing how to stay warm camping during the colder seasons is a must. Being constantly cold will ruin your adventure. The good news is that there are plenty of reliable ways to keep warm when facing the great (cold) outdoors! Here are 8 ways to stay warm during your cold weather adventures. During off season, there are endless places to set up camp. Instead of picking the first site you come across, find one that works in your favor. When picking a camp site, avoid low areas. Valleys and other low areas are typically colder. These areas are also more likely to experience wind. With the right camp site, you’ll be able to stay warm. Did you know that the average winter backpacker needs 4,500-5,000 calories a day? Camping isn’t the time to worry about the number on the scale! 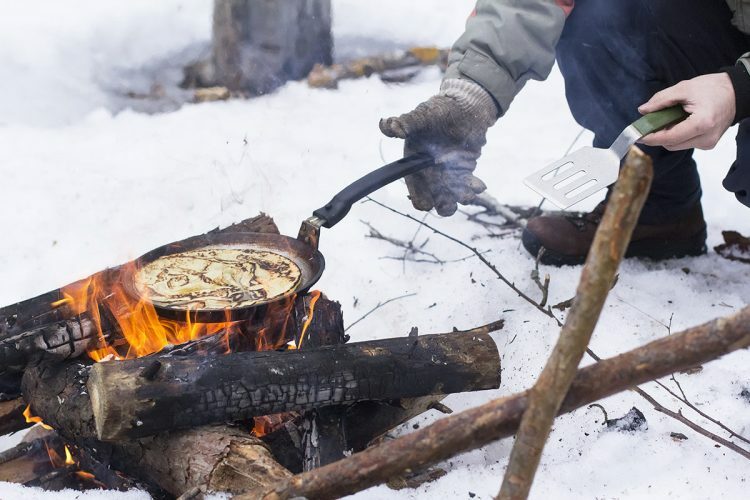 Large hearty meals are a must during colder temperature camping adventures. Simple dishes like pancakes are also easy to make and can be combined with all manner of toppings to create a substantial meal. You’ll also want to pack plenty of snacks. Snacks are a great way to replenish burned calories while on-the-go. Calories are units of heat. When calories are burned, your body is kept warm and energized. Calories are especially important if you are shivering! While calories are important, don’t forget about proper hydration. Ensure you are drinking at least a gallon of water a day. One of the keys to staying warm is having a warm head. When exposed, most of your body heat escapes through your head. Want to keep yourself as warm as possible? If so, wear a winter-proof hat! When packing, be sure you bring extra socks and hats. A cold head and cold feet will make the rest of you cold. 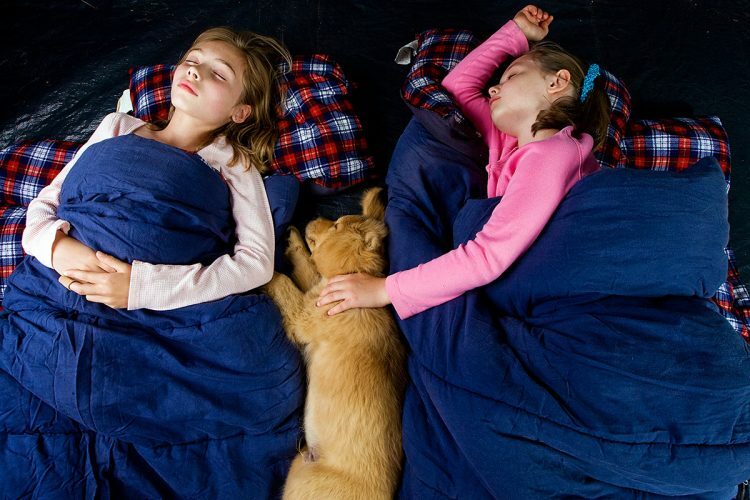 When temperatures are low, an extra-warm sleeping bag is a must. Consider purchasing a 0-degree bag. Are you a female camper? If so, purchase a woman’s sleeping bag. These bags will hug your body helping you to stay warm camping all night! A woman’s sleeping bag offers extra insulation at the bottom and top. These bags are also fitted. This means fewer air pockets and more trapped heat! Aside from a sleeping bag, you may also want to pack extra thick blankets. These obviously add bulk which is fine if you’re car camping but not so convenient if you’re backpacking. Want to keep your body off of the ground? Consider bringing an inflatable sleeping pad, air mattress or camping cot. When camping, a bed time routine is a must! To keep warm, you’ll want to do a few physical movements before hitting the sack. During sleep, the body cools. This means that you’ll want to go to bed warm! Consider a brisk walk. This will raise your temperature and heart rate. Remember exercise also releases those feel good endorphins and makes you feel positive. Your routine should also involve proper bedtime camping clothing. Don’t hesitate to sleep with your socks and boots on. The more insulating layers you wear to bed, the warmer you will be! Another effective method for keeping warm camping is to bring additional heat sources. There are plenty of items that can be used to provide heat. When sleeping with a suitable heat source, place it between your legs (not the fire of course!). This will flow the heat along your femoral artery, warming your whole body. If the heat source is too hot to the touch, use a towel or shirt to lessen the heat exposure. 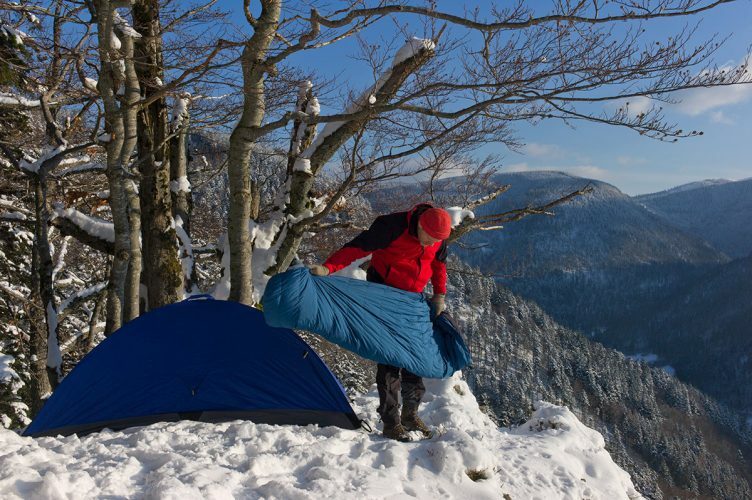 A smaller winter style tent is more likely to keep you warm. Small tents have less heat leakage. This means you’re more likely to stay warm during the night! Another way of keeping warm in a tent is to cuddle. This means you’ll want to go camping with someone you wouldn’t mind being close with! Close quarter camping will keep you and your partner warm and comfortable. Wet gear means a cold camper. Ensure your bedtime clothes are entirely dry. The same goes for your tent and sleeping bag. Sleeping when it’s cold and damp can be near impossible. Protect your gear and keep it dry by practicing proper storage. If your gear does get wet, do not sleep in it! Instead, let it dry and try wearing that piece of clothing another time. Are you an avid camper? Looking for camping gear reviews to ensure a quality purchase? Want to learn how to stay warm camping during cold months? If so, All Camping Stuff is just the site you need. Want to boost your camping knowledge? If so, check out our website and learn more about us!